Phonetic Solutions Unicode One Devanagari font in three encoding ! Can you type in Hindi...? There are three answers, some say 'yes' some 'no' and rest will ask which font or encoding you want. Because there is no single font encoding is used worldwide for Devanagari. Even in India where Hindi and Marathi have huge users still not one layout is used. People only using remington gail or only phonetic layout can't type on pages of websites (like comments, forums and typing tests) because only unicode is supported here. In Maharashtra where mostly Marathi language is spoken, almost a phonetic layout is common for typing purposes. For Hindi there is not one single layout is in use. Government encourage to use single layout for Hindi typing i.e. Unicode, but if we look at government service departments there is Remington Gail keyboard is very common due to tradition use of typewriters. Although today typewriters are rare here but still layout is available in form of computer fonts supporting remington gail layout. In clerical and typing jobs candidates required to prove their skill in different different fonts and encoding. Like Kruti Dev 010, Shivaji or Unicode. Please note that here we are talking about changing encoding with same design and typing test is to deal with encoding. Candidates should practice keeping the same encoding. 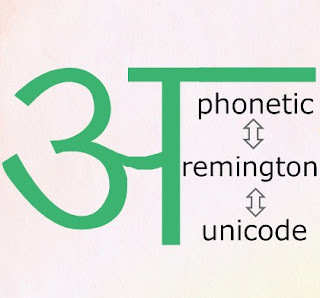 If one have to practice in Kruti Dev 010, it means he should be good at remington gail encoding not Gurumaa-2.04 (Unicode) or Marathi Sharada (Phonetic) although they all look same by appearance. So here are some fonts which can be found in other encoding like Kruti Dev 500 (or DevLys 500) which is in remington style can be also found in phonetic encoding as Aarti font. Finally got one most used Devanagari font in all three versions. Professional Kruti Dev 010 now can be used also as phonetic and unicode font but name will be Marathi Sharada and Gurumaa-2.04. If someone like a font and want to use it in his website but not supported due to nonUnicode font can pick a font from this table under unicode column. Sir, kya chankya,krishna aur hindi unicods fonts ki bhi series hoti hai jese kruti dev or devlys ki hoti hai. SIR, chankya, krishna aur hindi unicods fonts ki bhi series hoti hai jese kruti dev or devlys ki hoti hai. Sir, I installed cv ganesh font, but is is not working. its key is different from kruti and other hindi fonts. Use Type*2 layout for such type of fonts. I want to type Hindi on pdf file with Nitro software. But it doesn't work good. It types सिंह as सींह or सीनह. I am using MS Hindi Tool for Hindi typing. Any better way to do it? Please. Consider Unicode fonts they will work fine.